In my first real foray into using Flickr to share photos after a vacation, two of my photos were located by a writer for NowPublic.com, a Canadian news sharing organization. 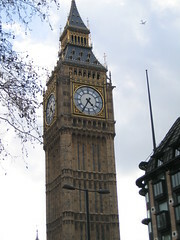 I went to London over this past weekend and took some shots of Big Ben, which can be found at right and here. Neither are anything spectacular, but they fit into a story she wrote on the 150th birthday of Big Ben. I am just amazed that in all of the photos on Flickr, mine were located and I was contacted about them. (Not that this is anything new, as Hyku would tell me.) I guess it just goes to show that the right tagging and description can help separate your work from the rest of the online clutter. Wow, what an interesting coincidence. I’m in London today and took some shots of Big Ben on the Big Birthday. I’ll upload them to Flickr shortly! Now, how cool is that!?! You just got back from the place that is at the topo of my “I’d love to go there” list. I’d have to spend about a month there though to see everything I would want to. I love clocks! I have quite a few. If I ever get to London, I’ll definitely have Ben on my list. Your photos are wonderful. Alas, no I did not. So I have not quit my day job.